The great thing about Vintage Santa is that he is comprised of several cultures. Father Christmas, Saint Nicholas, Kris Kringle and more are all part of the composition of Santa Claus. New York's Clement Clarke Moore's 1822 poem "An Account of a visit from St Nicholas" helped shape the image of the rooftop jumping gift giver we know of today. Scroll all the way down for resources on places to get great info on collecting vintage Christmas and Santa. With the Vintage Garage Holiday Market coming November 2oth, it's a perfect time to talk about collecting Vintage Santa Clause. Collecting in this category is really broad. You can narrow a collection of vintage Santa down into so many different categories. There are a TON of possibilities for collecting. There are Santa ugly sweater collections, nutcrackers that look like Santa, all celluloid Santas, Disney characters dressed like Santa. I could go on and on but let's start with some basics. 100 years or more Santa Clause. So prior to 1916. What could you hunt for? How about Santa in different colored suits? 19th century Santa wore all colors. Blue, yellow, green. It wasn't until the 1900's red became prominent. Composite made German Santa of the early 1900's and sometimes even older paper mache German Santa. These were figures made by craftsman and of fragile materials. Today they command higher prices because of it. Santa vintage ornaments Here you could go from antique glass ornaments to cloth ornaments or narrow it down by era or both! You could collect Santa made with a pinecone. Spun cotton. How about 1960's modern ornaments. There are actually pretty tough to find and I always pick up Midcentury when I can. 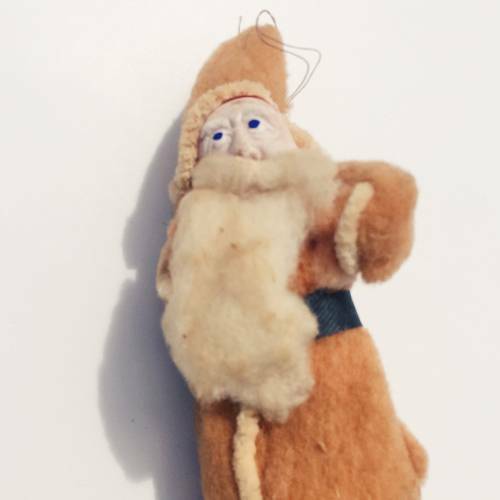 How about felt Santa ornaments? I think you get the picture. Possibilities are endless. You will never run out of things to hunt for if you narrow your vintage Santa collecting down to just plastic Santa. You can break it down further into just ornaments or blow molds or whatever your heart desires! Hard plastic was popular in the 1950's and 1960's. 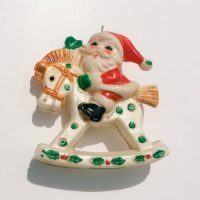 Celluloid is another type of plastic used to create Christmas items but became scarce after 1930 due to it's flammability. Japan and Europe decided it was fine so they continued production of celluloid items until the last 1950's. Narrow down by era and you've got yourself a hunt! The Golden Glow My favorite website about collecting Christmas. Golden Glow Group on Facebook They know so much and are so passionate.